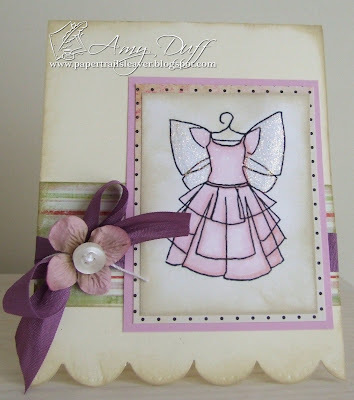 A pretty pink fairy dress is my card for today. We have an "anything goes" challenge at Crafty Creations which gave me the chance to let my mind go with whatever I like. I am enjoying using Copics and will say that it's true about the more you use them, the better they get! Also addictive warning. Highly addictive to buying these little sticks. I took my cue from the photo and colored the dress in light pink shades to match. Doesn't this look yummy? Oh wow! I am so craving sweets these days. 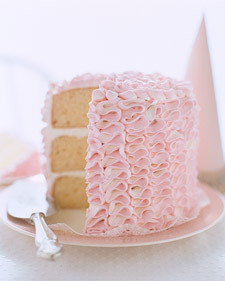 I wonder what this 3 layer cake tastes like? I am trying to imagine and it's making me salivate. So pretty Amy! Love the glittery wings and soft colors! Amy! I just had to stop by and leave a comment about this beautiful card. The dress is stunning and looks ready for that lovely fairy to fly into it!!! Beautiful card! Love that sweet image! Thank you so much for joining us this week at The Shabby Tea Room! Gorgeous card. I love the colours and the image is so pretty. Thanks for joining us at Creative Craft Challenge. The subtle coloring is GORGEOUS. And you created a perfect balance of colors, neutral papers, elegance and a gorgeous bow. Wow Amy I love your take on the inspiration!! It is really beautiful...simple and vintage all together! A beautiful card. I love the colours. Thank you for joining us at Creative Craft.